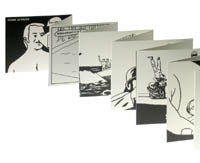 More and more intriguing is the work of Pierre la Police, who is definitely my favorite french comic book writer. 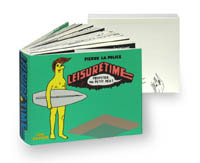 His last piece of work "Leisure Time" is an odd 50-pages foldable book. A bit expensive (200 euros), it addresses the notion of "leisure", illustrating the leitmotiv "let's have fun a bit" ("profitez un peu" in french) with diverse representations of modern world situations ranging from surfing to pressing a button that would deliver tea or putting little masks on one's nails. He seems to be more and more into the same vein as Glen Baxter, which is worthwile too. Do you work according to specific plans or do you rely on your intuition ? The way I set to work is different each time. I often accumulate elements that I classify according to a personal logic. I have piles of pictures with crabs, boxes filled up with magazines specialized in the study of charcoal. Sometimes all that gets mixed up, and when looking at this chaos, I manage to extract stories from it. Just in the same way you would remove sausages from a barbecue. It often occurred that things I had imagined eventually happened in real life. That’s not really surprising, it happens to everyone. This nicely expresses how connection between dots (knowledge, people, ideas, meme) can be done today.